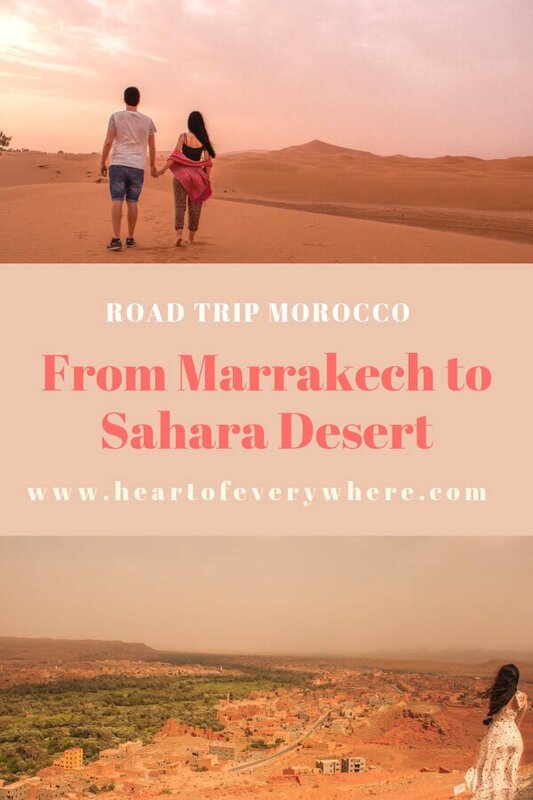 In this Morocco itinerary, we will share with you not only the places we visited during our road trip through Morocco but also all expenses, the beautiful hotels where we stayed and many useful tips for those who want to explore this beautiful country by car. 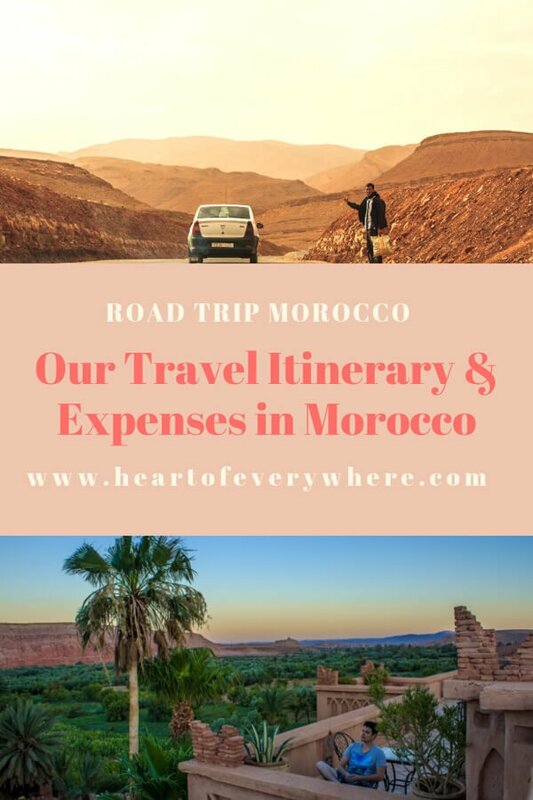 Delineating the itinerary for our road trip through Morocco was not an easy task. We wanted to head north in search of Chefchaouen and all the imperial cities of Meknes, Fez and Rabat. But we also wanted to explore some of the coastal cities like Casablanca, Essaouira and El Jadida. Meanwhile, traveling to the Sahara desert was also one of our top priorities. Having only 9 days of vacation we had to make choices and cuts on our itinerary, we wanted these days to be full of discoveries and breathtaking landscapes, we wanted to be constantly astounded by the beauty of every kilometer. But after all, these 9 days would also be our holidays from work and we didn´t want to be constantly in a rush, just to scratch the places out of our itinerary. Therefore, we decided that we would rent a car in Marrakesh for 5 days and head to the Sahara desert. We might have left out of our itinerary a lot of places that we wanted to visit. Still, we had the opportunity to drive not only the mythical and extremely curvy Tizi n’Tichka road, but also the Route of the Thousand Kasbahs and we stopped along some of the most iconic and characteristic places of Morocco, such as Aït-Ben-Haddou, the Todra Gorges and the Dades Valley. We spent the remaining 4 days of our holiday in Marrakech. If you are thinking of visiting Marrakech, be sure to read our Essential Guide to Surviving Marrakech. 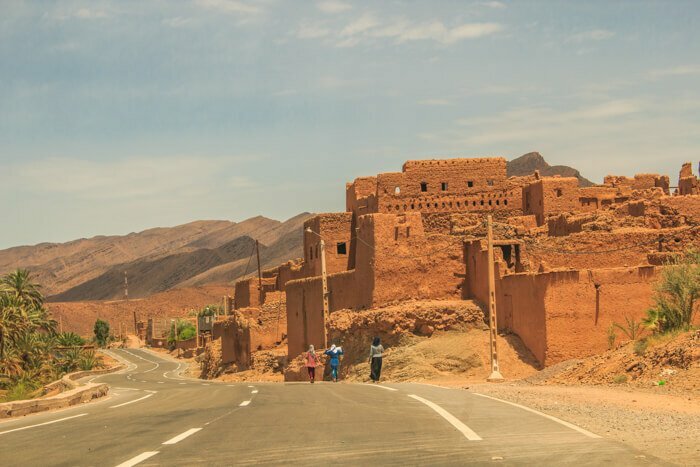 After finishing the paperwork of renting a car in Marrakesh with Medloc Maroc, we left the hectic Marrakesh behind and drove to Ouarzazate. The distance between Marrakesh and Ouarzazate is only 197 km. Anyone who doesn´t know the road, might assume that won´t take more than two or three hours to arrive at Ouarzazate. 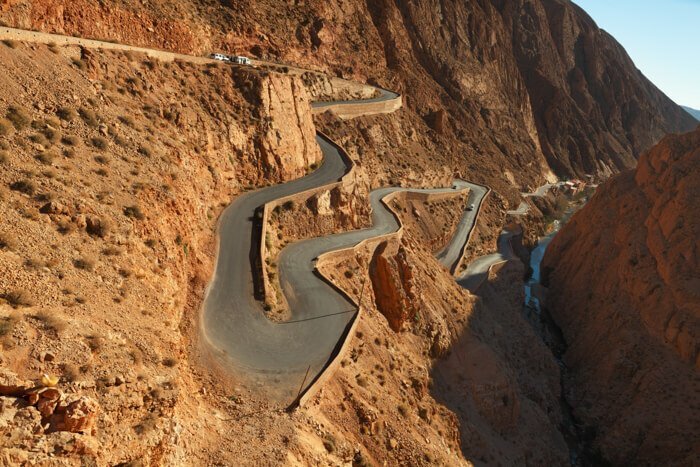 However, to reach Ouarzazate it is necessary to drive the legendary Tizi n’Tichka mountain road, at 2260 m altitude, where the tight curves are more than many. 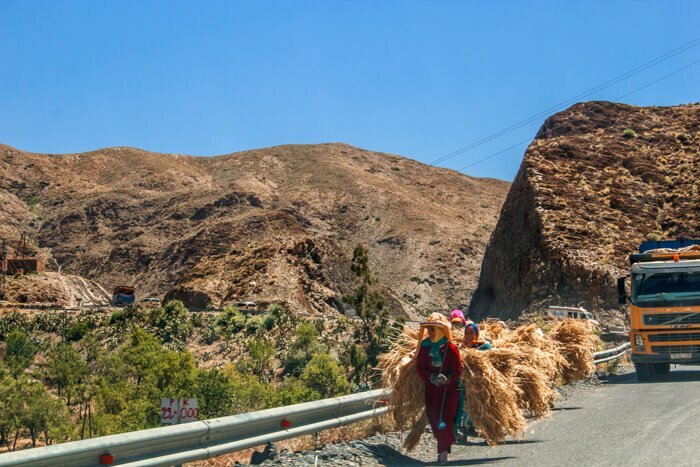 At the time we drove Tizi n´Tichka, some sections of the road were under construction, which led to some traffic congestion, since the traffic occurred alternately. 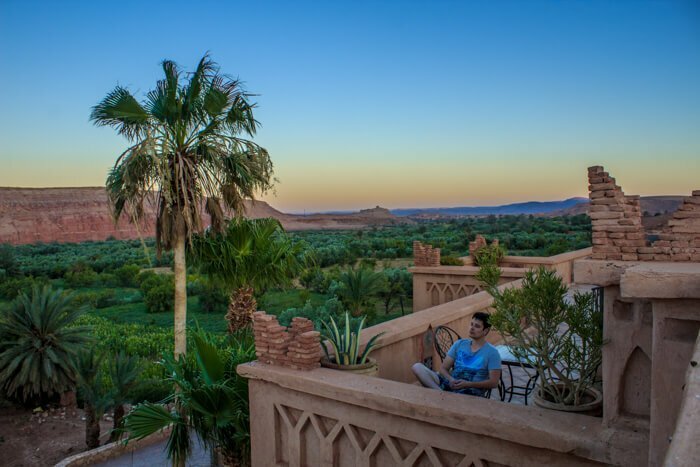 Ouarzazate & Aït-Ben-Haddou: Where to stay? Those who have been following our blog already know that we have a crush on charismatic hotels. 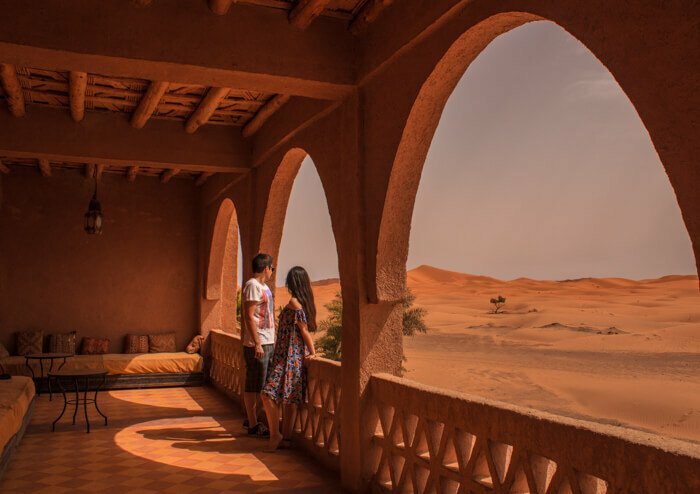 We were therefore anxious to arrive at Ksar Ighnda, a hotel whose architecture reminds us of an authentic palace straight out of Arabian Nights. The rooms are small, though very beautiful and cozy. What did we like the most? The vast number of terraces to relax and enjoy the views at the end of the day and the location! 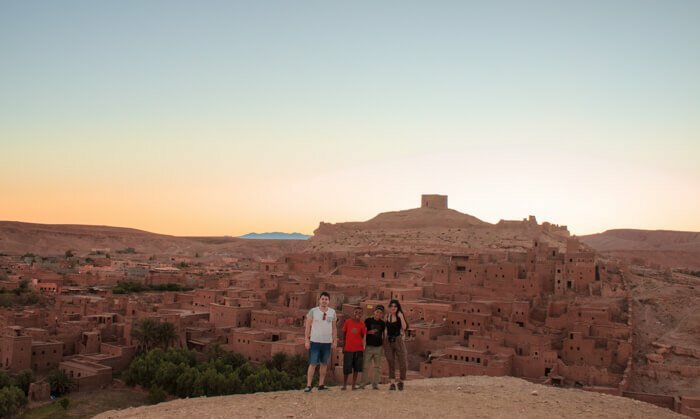 It is less than a 3 minutes drive from Aït-Ben-Haddou. It was with some disappointment that we noticed that breakfast is not a buffet. However, it was delicious. Price: We paid 135€ for a standard room with breakfast included. 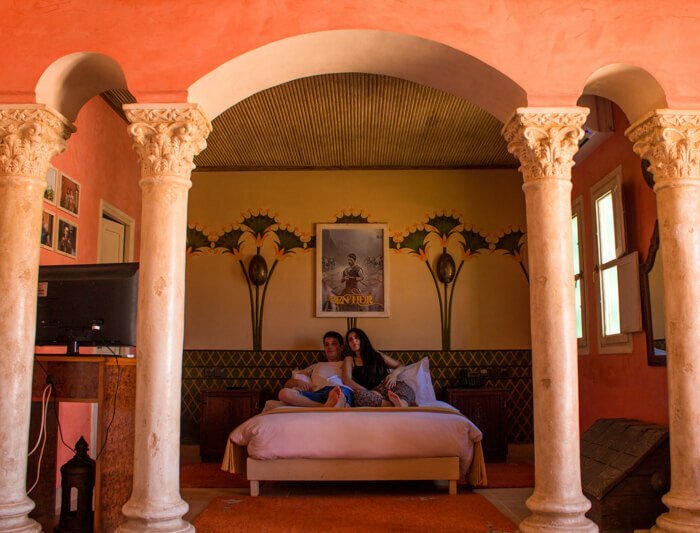 Click here to book your night at Ksar Ighnda. On the next night we went for a cheaper option, but still very comfortable. We chose to stay at Oscar Hotel, which is located inside the Atlas studios in Ouarzazate. Oscar Hotel doesn´t have the same architectural advantage of Ksar Ighnda , its architecture doesn´t resemble a palace. But the value for money is incredible! As the hotel is located within the grounds of the Atlas film studios, all its decoration revolves around the films recorded here. As guests of the hotel, you are entitled to free tickets to visit the Atlas studios. Oscar Hotel has a swimming pool, restaurant and bar. 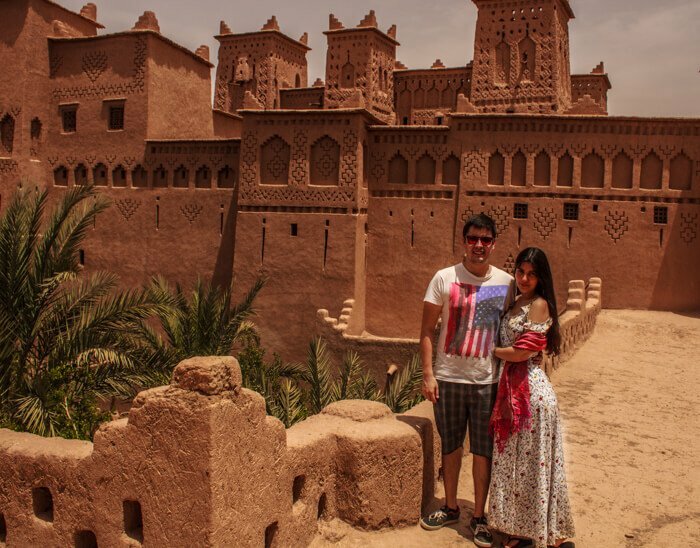 It´s located 10 minutes away (by car) from the center of Ouarzazate and 30 minutes from Aït-Ben-Haddou (by car). The breakfast is buffet. If you´re the exact opposite of us and enjoy starting your day filling your belly in a healthy and balanced way with tomatoes, lettuce, cucumber, then you will love it. Price: We opted for a spacious suite and paid only 59.50 €/night with breakfast included. Click here to book your night at Oscar Hotel. This was a relaxed day of travel, without great distances traveled. After breakfast at Ksar Ighnda, we traveled only 33km to get to Ouarzazate to check in at Oscar Hotel. We arrived before check-in time. While the hotel prepared our room, we decided to visit the famous Atlas Film studio. 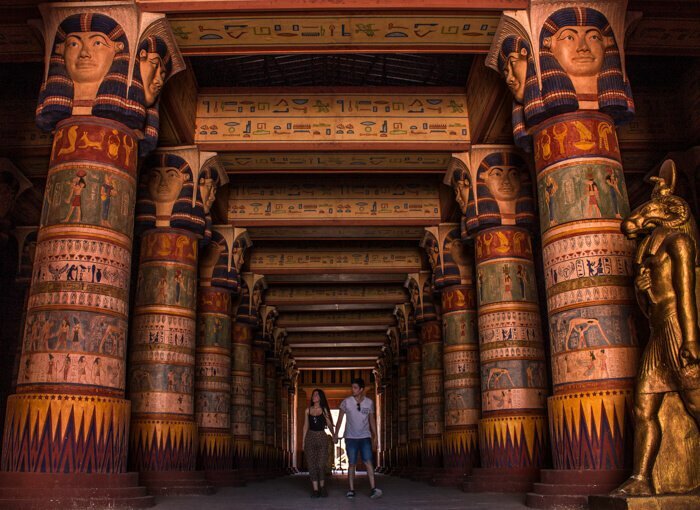 As we walked through these scenarios, it seemed that we were teleported to Egypt or even to China, but this sensation quickly faded when we went beyond the main façade and saw that almost everything in these scenarios is composed of decaying wooden planks . 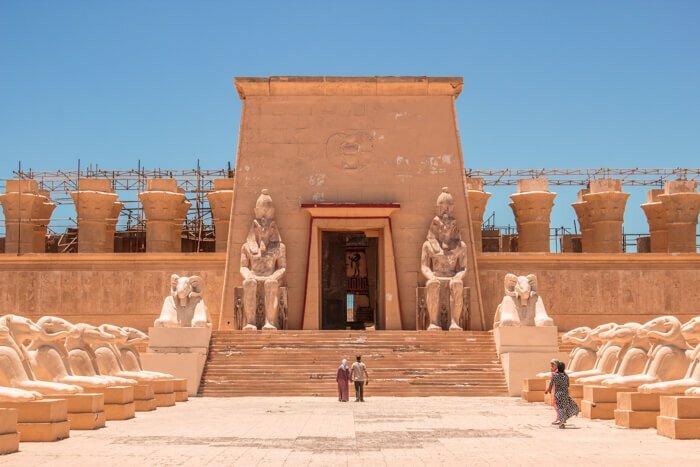 However, it is still interesting to discover the great array of films shot here, movies such as The Jewel of the Nile, Astérix & Obélix: Mission Cléopâtre, Gladiator and many others. Besides Atlas Studios, there is also CLA movie studios (CLA Studios), where you can visit the great city of Jerusalem or even Mecca. We visited Aït-Ben-Haddou in the afternoon. When we arrived at Aït-Ben-Haddou, each of us paid 1€(10 Dirhams) at the entrance. We had barely taken our first steps in Aït-Ben-Haddou and we were already being invited by two smiling kids to visit a typical Berber house. We asked if we would have to pay and they said no. Apparently, the euro that we paid at the entrance already covered the visit. Although our communication with these two kids was essentially by gestures and smiles, they kept on walking with us throughout our visit. They even offered to take us to a place with an astonishing view of Aït-Ben-Haddou. We must confess that after all the “help” we received in Marrakech, we were always waiting for the moment the kids would ask us for money, but they never did. They were just kids being kids, having fun on a summer afternoon. After visiting Aït-Ben-Haddou, we were still invited by Abdul to have tea in his shop. 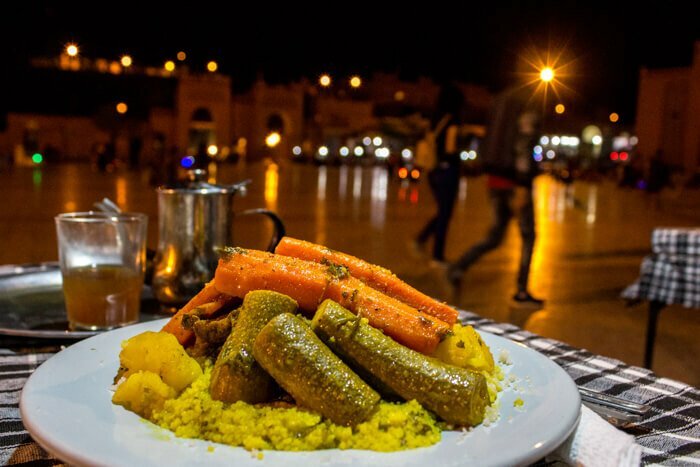 When we went to dinner at the Al-Mouahidine square in Ouarzazate, it was past midnight. It was here that a girl, no older than 10, with sweet eyes and perfect English, stopped playing football to approach us and suggested us to have dinner at her parents’ restaurant. Since we were both starving, we didn´t even blink towards such invitation. After driving for more than 5 hours we finally reached the Sahara desert. We kept listening to the radio during the 5 hour drive, or at least we tried our best to make the radio work, but without much success, the lack of signal was a constant. 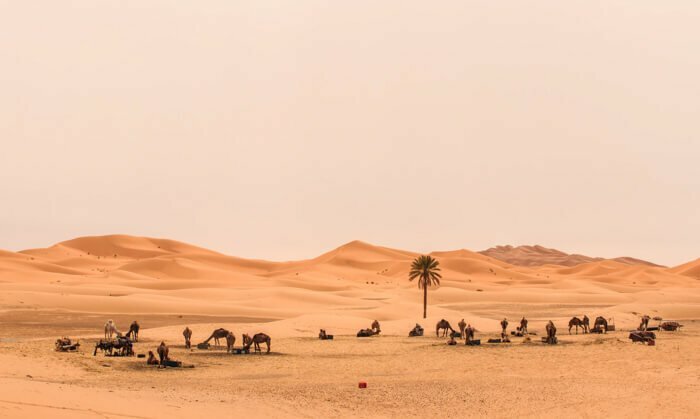 Sahara Desert: Where to stay? In life there are, certainly, harder decisions than choosing where to stay in the Sahara desert. However, while searching for accommodations in this area, we were constantly divided between the Kanz Erremal Hotel and its pool planted in the desert, and the luxurious tents with dinner included. Regardless of choosing wisely or not, we had to choose one and ended up choosing the Kanz Erremal. Click here to book a night at this hotel. Kanz Erremal is far from being our favorite hotel. However, we can´t deny that its picturesque pool gives it some extra points. Although we had read negative reviews regarding food at Kanz Erremal, we chose to have dinner at the hotel and we were quite pleased, the food served was simple but delicious and in enormous portions! They served us rice with tuna and corn, vegetables and chicken tajine, 4 orange juices and a plate of fruit. The whole dinner was around € 17. During dinner we still had the privilege of watching a Berber music show. 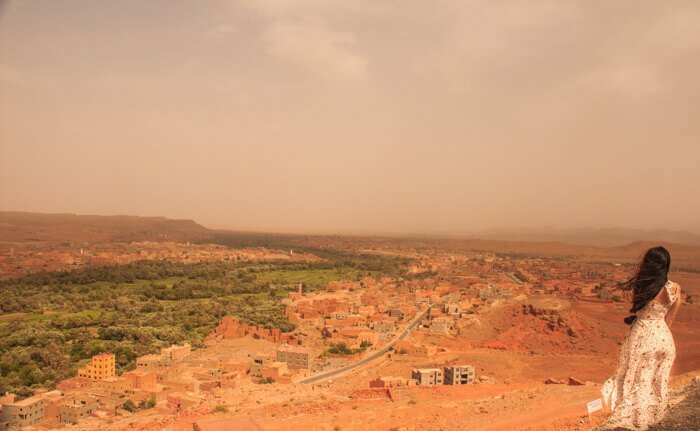 We left Merzouga, the small village of the Sahara desert near the border with Algeria, and its 50 ° C. We saw the landscape change, gradually, as we walked away and, most likely, a sandstorm forming before our eyes. After a short stop in Alnif to lunch a Berber omelet, we drove towards the Todra Gorge. It is often said that in travel as in life, the important thing is not the destination where we want to arrive, but rather the journey. Thus, no matter how cliché it might be, it is still the most appropriate way to describe this day of travel. More impressive than the Todra Gorges itself, was the journey to get there. When we arrived at Tinghir our eyes were dazzled with the stunning landscapes that we had ahead us. Tinghir is just a half hour´s drive from Todra’s Gorges. We followed Todra Gorges road with the permanent hope of soon finding the famous road of the narrow and amazing curves, the road that appears when you search on Google for “tizi n’tichka” or “todra gorge road” but we can now guarantee you that this road is not located in any of these two places. Without having found the road that we had long dreamed about and without a GPS signal we continued to Ait Hani. Although we were out of our way to Skoura, we were not at all frustrated, the mesmerizing landscapes would not allow us such a thing. 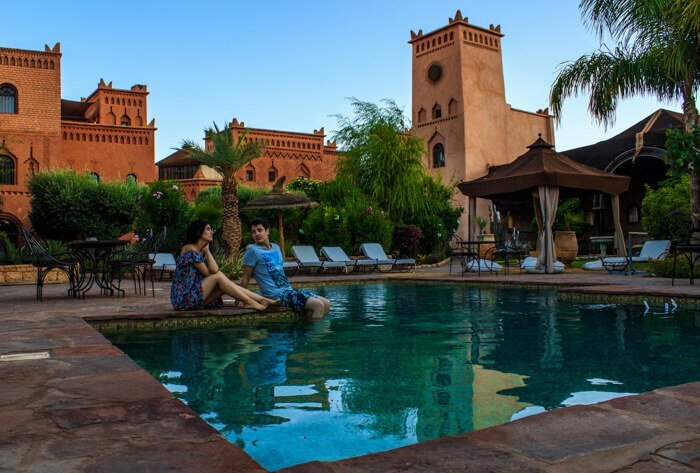 We chose to stay overnight in Skoura, at Espace Kasbah Amridil, we wanted to stop somewhere on the way to Marrakech, so that on the next day we wouldn´t have such a long travel day ahead of us. So we chose Skoura, which is just 45km from Ouarzazate. The oases of the Todra and Dades Valley landscapes differ from everything we have ever seen, impossible to forget. The ocher tones of the houses, the rocky and arid mountains, form a clear and mesmerizing contrast with the vibrant green from the oases. Before we left Skoura, we made a pit stop at Kasbah Amridil which was just a step away from the riad where we decided to stay overnight. 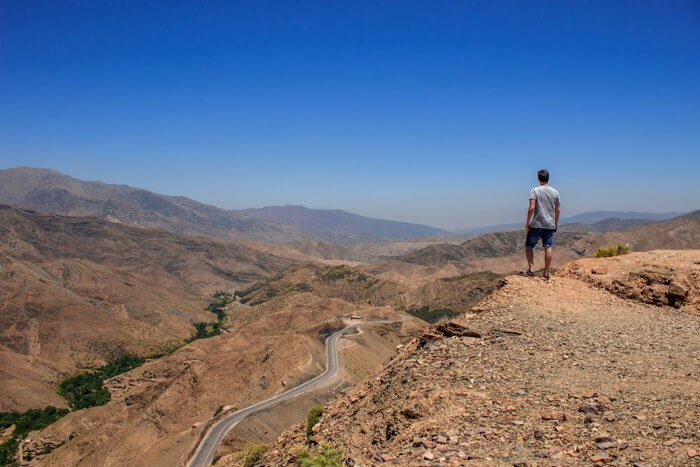 While returning to Marrakech we drove once more through the famous Tizi n’Tichka road. We arrived in Marrakech at dusk, where we stayed for a few more days. If you´re also planning to spend some days in Marrakech, you should also read our Essential Guide to Surviving Marrakech. 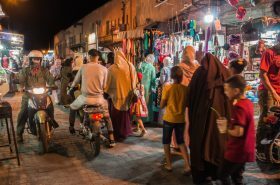 # 1 Should you bring your own car or renting one in Marrakech? Since we live in Portugal, we also considered to take our own car on this road trip with us. The answer to this question depends on how many days you have, what part of the country you want to explore and your willingness to drive for several hours on end. If we had chosen to bring our car the cost would be almost the same we spent on our plane tickets. Crossing by ferry from Tarifa (in Spain) to Tangier (in Morocco) with the car costs around € 200, plus € 50 per person. During our 9 days of vacation, we could have brought our car from Portugal and go to the South of Morocco. But it would be much more tiring as we would have to drive constantly. We wouldn´t have enough time to enjoy each stop along the way. However, next time we head to Morocco to explore the north, we might take our own car with us. # 2 Do you need a 4×4 car to road trip through Morocco? Before we made this road trip, we thought that a 4×4 car would be essential for a road trip through Morocco. However, if you are driving only on the main roads and not outside them, a normal car is perfectly suited for your Moroccan road trip. The roads of Morocco are as good as the ones we have in Portugal. Of course, that just like ours, there are sections of the roads which are far from perfect and are already old and bumpy. But we don´t think that this is reason enough to justify the need of 4×4. #3 How to find a reliable rental car company in Marrakech? After reading hundreds of awful rental car companies reviews in Marrakech, we almost gave up on the idea of renting a car in Morocco. We thought that finding a needle in a haystack would be easier than finding a trustworthy car rental company in Morocco. As a general rule, when you rent a car in Morocco, you will be asked for a deposit of about 10 000 Dirhams (~ 900 €). This money is not withdrawn from your account, but is held captive until the day you deliver the car. The problem is that many companies take advantage of this and blame you for damage that already existed in the car, so they don´t have to return your hard-earned 900 €. As neither of us, makes a leaving stealing wallets, the possibility of being scammed and loosing our 900 € left us terrified. One happy day, we found Medloc Maroc and their great reviews. 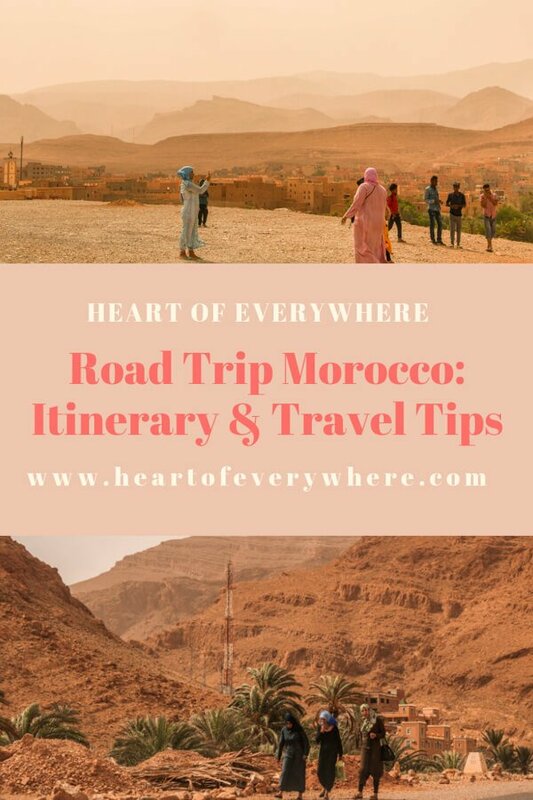 Finding, Medloc Maroc was a breath of fresh air and everything we needed to bring back to life the idea of ​ doing a road trip through Morocco. Medloc Maroc prices are extremely affordable, they have normal cars starting at € 25/day and 4×4 starting at € 70. The deposit was 20 000 Dirhams, nearly (1800€), but two days after returning the car, the money was back on our account. The deposit money might be a little higher than in other companies, but we prefer a higher deposit and have our minds in peace, than having a lower deposit, but risking losing it. Moreover, the care and attention Medloc Maroc has with their customers is outstanding. Precisely at the agreed time they came to meet us at the riad where we were staying. Medloc Maroc employes are also extremely friendly and even cared enough with us to drive us out of the chaotic center of Marrakesh. If you´re looking for a trustworthy and professional car rental company in Marrakech, look no further than Medloc Maroc. After trying their service, we only have great things to say about them! 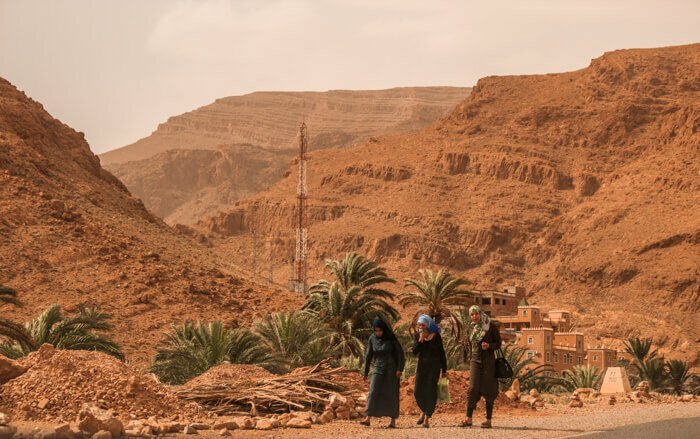 If you are planning to road trip through the South of Morocco, you should visit not only the Todra Gorges, but also Dades Valley and its canyon. In Dades Valley, you will be in the right place to find the famous road of the curves, the one that we were both dying to find and drive, but which we left without finding it. This epic curvy road can be found between Boumalne Dadès and Agoudal. In order to guarantee that you´re on the right path to find this road, you can program your GPS to the hotel Hotel Timzillite, since this hotel has a privileged view to this road. You don´t need to stay there overnight, it might serve only as a reference point. 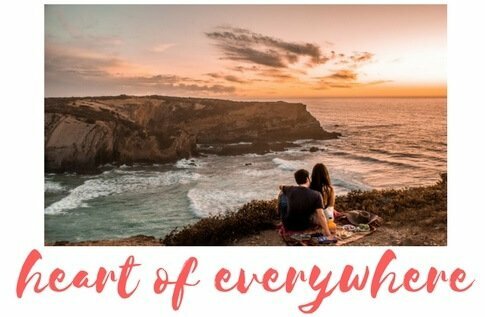 We do love maps and when we make road trips through Portugal we love to hit the road with a road map with us. But in a foreign country we can´t argue with the fact that GPS is a life saver. When we rented the car we chose a car with GPS included, what we were not expecting was that this GPS didn´t know many of the destinations we intended to go and ended up being useless. If you have a mobile phone unlocked to all networks, we strongly advise you to buy a local SIM card as soon as you arrive in Morocco so that you can have internet everywhere and use Google Maps every time you need it. Although, during our days in Morrocco, Google Maps didn´t behave itself quite like the GPS we were expecting, as it failed to indicate whether we should turn left or right as he usually does in Portugal, we still could see the roads and the route we had to take to arrive where we wanted. When we arrived in Morocco we bought a local SIM card from Orange . We paid around € 7 for both the card and 5GB of Internet. I love listening to music from other countries and I was full of expectations about Moroccan radios, but I must tell you that during this road trip we spent a lot of time without radio signal or only catching signal of radios that most of the time seemed to have prayers on, which was not exactly the soundtrack we were expecting to find. Budget for this trip – How much did we spent? Flights: 259 €/person (Lisbon/Marrakesh – Marrakesh/Lisbon) with Royal Air Maroc (baggage included). Both with a stopover in Casablanca.